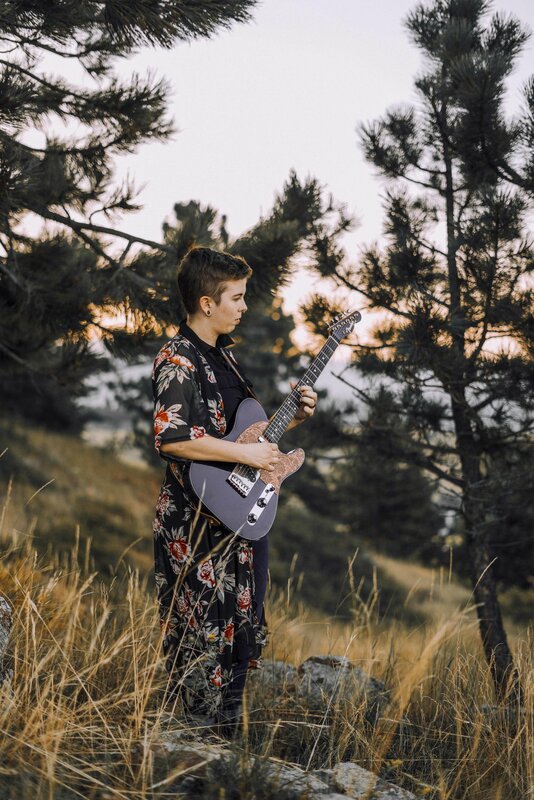 Kenzi Everitt is a guitarist and vocalist in a four part band called Kinsecis. The other members of the band include Malena Roberts, Corban Roberts, and her now-fiancé Jason Barteck. They recently came out with their first album, Surfacing, which they recorded entirely by themselves. Kenzi never pictured herself performing the songs that she wrote, her goal was to write and publish songs for other people. “I found out that if you’re around the right people [performing] can actually be fun, same goes for recording,” Kenzi stated. Kenzi is also a media director for a project called Lady Cactus. This is a group of musicians in Denver, Payden Widner, Jason Barteck, and herself, that started creating videos of, mostly, local musicians playing their music in outdoor settings. The group accidentally started this project two years ago. Sydney Clapp, a musician who wrote a song about her grandmother who had passed, wanted a high quality recording of it for family. They went up to Lookout Mountain in Golden, Colorado and filmed on the side of the road while the sun was rising. Kenzi and her group realized how much they loved making the video and decided to continue. She reached out to their friends asking who was interested and were surprised with numerous responses. Kenzi asked, “Who wants to wake up at 4 AM and drive out to the mountains to play music?” Well, it’s been an adventure of people playing music the night before, getting one hour of sleep, and then coming to her house to drive into the Colorado mountains. Kenzi was born in Grand Haven, Michigan to two musically driven individuals, Alex Everitt who is a drummer and Kim Everitt who is both a saxophonist and pianist. Kenzi started playing piano as early as preschool. By the age of four she had gone through several instructors who proclaimed she was “too bossy.” Kenzi took the liberty to tell one of them to chill out. In 1997, Kenzi moved to Colorado with her family. She started playing guitar while attending Lakewood High School. Her first instructor, Melanie Crane, moved to Greece early into her lessons and gifted Kenzi her first guitar, an S.Yairi, which she passed down to her sister, Aleigha Everitt. From 2010-2014, she took lessons from Steve Varney, who plays with Kid Revery and Gregory Alan Isakov. He taught her from his unique perspective about singing and songwriting, which she has used to great effect in her blooming career as a musician. Kenzi took her passion for music further and graduated from CU Denver in 2017 with a Bachelor’s in Music Business. When Kenzi isn’t playing music or working with nonprofits, such as “A Little Help” which assists adults with tasks they’re unable to accomplish by themselves, she’s lending a hand in her community. Kenzi says the best way to be involved and stand out in your local music community is to offer yourself as a volunteer or employee whenever possible. This July alone she worked for 14 days straight for a Denver festival call the Underground Music Showcase or UMS. Kenzi is also an events director for a program called Girls Rock which is a summer camp for young female identifying and non binary campers between the ages of 8 and 18. In this 100% volunteer run camp, these campers learn to play instruments, write songs, form bands, and perform in front of an audience. They’re also offered other workshops to learn skills from fly fishing to running for office. At the end of the week, the campers get to play their originally written songs to an audience in a Denver music venue. Kenzi has been volunteering with Girls Rock for four years, and completely loves it.